High strength, multi-purpose, quick grab building adhesive. Perfect for porous substrates and can also be used with polystyrene. Replaces mechanical fixings in a wide variety of applications. Use for fixing materials such as wood, brick, plaster, and plasterboard. 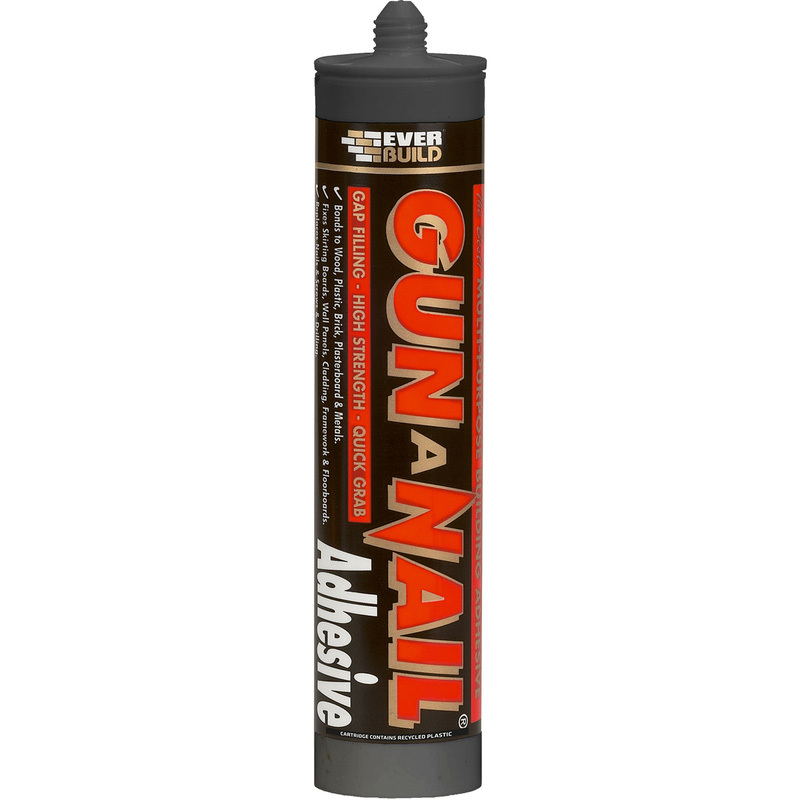 Gun A Nail Solvent Free 310ml is rated 4.8 out of 5 by 18. Rated 5 out of 5 by Fitter 1 from Good stuff. Excellent value does what it says on the tin, so to speak. Easy to spread little effort to come out of tube, even with a weak grip. Sticks and holds really well. Rated 5 out of 5 by Mirramar from Excellent fast grab to any beading Perfect adhesive and filler in one.Quick grab and very strong bond. Rated 5 out of 5 by Ticker from Best value for money Have used this product before. It is not the quickest setting, but it it does the job as good as many other, more expensive products. Rated 5 out of 5 by Anonymous from Better than leading brands Iv been buying this for a couple of years now and haven't been let down by this adhesive yet. Ever since i switched from Liquid Nails to this I haven't looked back. This is around a 1/3 of the price and is alot better in application too. I use this for numerous jobs and I find its particularly good at fixing coving (its even better than specifically designed coving adhesives). I cannot rate this adhesive highly enough.